Lowen arrives at the Crawford home, ready to sort through years of Verity's notes and outlines, hoping to find enough material to get her started. What Lowen doesn't expect to uncover in the chaotic office is an unfinished autobiography Verity never intended for anyone to read. Page after page of bone-chilling admissions, including Verity's recollection of what really happened the day her daughter died.Lowen decides to keep the manuscript hidden from Jeremy, knowing its contents would devastate the already grieving father. But as Lowen's feelings for Jeremy begin to intensify, she recognizes all the ways she could benefit if he were to read his wife's words. After all, no matter how devoted Jeremy is to his injured wife, a truth this horrifying would make it impossible for him to continue to love her. Costco can't even stock the amount of wine that you'll need while reading this book! Whoa boy! Buckle up! Do you remember(or maybe it was just me) how you felt when you heard that the creator of Glee, Ryan Murphy, was the same creator of the American Horror Story series? I remember watching Murder House and thinking: "The mind of Glee created this?!". That is exactly how I feel about this book. The Colleen Hoover mind we've all fallen in love pulled a major plot twist on us! Bravo, Colleen Hoover, bravo! 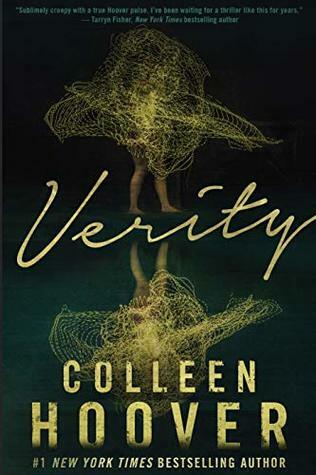 Verity has all of the CoHo qualities we love: Endearing characters, an irresistible plot and a beautiful, flowing writing style that just makes the entire package addictive. Be sure to carve out a block of time when diving into this one, because you will not be able to put it down. Food, kids, work, will all come second when it comes to dividing up your time when reading this! Verity starts off with a bloody bang, and the dark and twisted just continues deliciously on from there. Colleen Hoover does a spectacular job at pacing the story. She gives you just enough in each chapter to tempt you to keep on reading. The CoHo spell is cast over you and you much rather be reading than anything else! If you do, for whatever reason, have to put the book down, you'll be left thinking about it constantly until you can pick it up again. Verity is a mind-bending rollercoaster. It is a racy, wicked and taboo ride. Your knuckles will turn white from your grip on the book. Your gut will twist and you'll cringe. Once of the best reading experiences, I have ever had! You've been warned!